Leisure Boat Marine Coatings Market Size was estimated over USD 1 billion in 2016 and the industry will likely grow by a CAGR of about 6.5% up to 2024. The global leisure boat marine coatings market growth will be chiefly propelled by rising demand for luxury vessels for recreational activities. These vessels are principally sought after by the high-income individuals for personal and sports activities owing to the soaring prices involved in their purchase along with maintenance. These boats need special coatings for protection against deterioration as well as aesthetic enhancement. They protect the hulls of ships from corrosion and foul formations and hence boost a boat’s performance and life. The rising number of high net worth individuals (HNWI) across the globe will be a major growth enabler for the leisure boat marine coatings market during the forecast timeframe. The global HNWI’s wealth growth was registered at around 4% from 2014 to 2015 with Asia Pacific overtaking North America as the highest wealth market. More than 60% of the global HNWI population was concentrated in the U.S., Japan, Germany, and China. The number of HNWI individuals in the U.S. increased from 4,351 in 2014 to 4,458 in 2015. During the same period, the HNWI population in Japan and Germany also increased from 2,452 to 2,720 and 1,141 to 1,199 respectively. China registered the highest HNWI population growth rate of 16% from 890 in 2014 to 1,034 in 2015. This global trend is likely to continue in the future and will drive the leisure boat demand which will in turn propel the leisure boat marine coatings market during the forecast timespan. The revival of the U.S. economy from the downturn in 2008 will also be a major driving factor behind the leisure boat marine coatings market growth. The economic downturn had a significant negative impact on the U.S. recreational boating industry by reducing customer spending and lowering the credit securing ability of individuals. Many boatbuilders and dealers faced difficulty in funding their operations resulting in bankruptcies and business closures. However, the U.S. recreational boating industry has made a comeback in the last few years with demand increasing by around 8% per year till 2016. The industry has been driven by gains in customer disposable income as well as spending along with a rapidly strengthening financial sector. The disposable income per capita of individuals in the U.S. witnessed stable gains after 2008 reaching close to USD 39 thousand in 2016 from around USD 35 thousand in 2010. These factors have led to the revival of the U.S. recreational boating industry and is likely to spur the leisure boat marine coatings demand for manufacturing, maintenance, and repairing of boats. 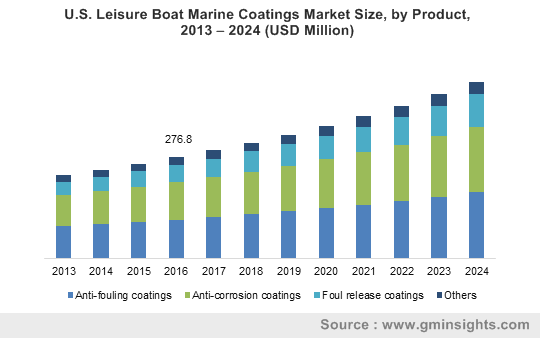 Based on product, the leisure boat marine coatings market is segmented into anti-fouling, anti-corrosion, foul release and other product types such as self-cleaning coatings. Anti-fouling product segment accounted for more than 40% of the overall leisure boat marine coatings market in terms of volume, growing with a CAGR above 6%. Although anti-fouling products pose a serious threat to the marine ecosystem, their demand has been witnessing a steady increase which is likely to continue in the future owing to the rising number of leisure boats worldwide. The development of products which have a lower environmental impact and the high prices of foul release product types which are a substitute for anti-fouling coatings will propel the segment’s growth in the forecast timeframe. Anti-corrosion product segment also accounted for a substantial share of the overall leisure boat marine coatings market in 2016 registering a revenue above USD 350 million. These are used to protect the hull of ships from abrasion, corrosion and impact and help increase their longevity and performance. This segment’s growth will be boosted by the increasing leisure boat maintenance and repair activities around the globe. Europe is a key leisure boat marine coatings market which is likely to grow by more than 7% CAGR during the forecast timeframe. Italy, Germany, France, Belgium, Netherlands and Austria are some of the countries that will experience high product demand in the forecast timeframe owing to increasing recreational boating activities as well as rapid growth in water based tourism and sports. Asia Pacific market growth will be chiefly propelled by increasing recreational boats demand in Australia, China, Indonesia, Malaysia, and Taiwan. Rapid growth of tourism in South East Asian countries will increase the demand for recreational boats which will in turn drive the leisure boat marine coatings market. The rising number of high income individuals in China and Japan is also likely to increase demand for leisure boats and propel the leisure boat marine coatings market growth till 2024. Key manufacturers in the leisure boat marine coatings market include AkzoNobel, Jotun A/S, Hempel A/S, KCC Corporation, Nippon Paint, Chugoku Marine Paints, Kansai Paint Company, The Sherwin-Williams Company, RPM International Inc., PPG Industries Inc., DuPont Coatings & Color Technologies, MCU Coatings International, BASF Coatings GmbH, Baril Coatings, Katradis Marine Ropes Industry S.A., and Axalta Coating Systems. Companies are trying to increase their market competitiveness by investing on developing new products that are environmentally friendly and provides higher performance. Marine coatings have been used in the boating industry since many years as they provide protection against fouling and corrosion. Recreational boating has been a major factor behind the increasing product demand as these leisure boats require higher maintenance activities to preserve their aesthetics. Rising popularity of recreational boating activities and water sports around the world will propel the leisure boat marine coatings market growth. Increasing disposable income as well as development of state of the art luxury boats will also impact the leisure boat marine coatings market positively during the forecast timeframe.